Kawasaki Motors Corp., U.S.A. (KMC) announced a unique tie-in with “The Lone Ranger,” a Disney/Jerry Bruckheimer Films production set for national release on July 3. The powersports products marketer will use this new reimagining of the popular story to help carry product messages for its off-road motorcycles, four-wheel vehicles and street motorcycles. Concentrating on a “Live the Legend” campaign line, Kawasaki’s effort is heavily oriented to video creations depicting a transition from the Gore Verbinski-directed film to scenes of modern day adventurers with the company’s Teryx4 Side x Side, KX motocross, and Ninja sportbike products. The action-oriented “Live the Legend” video appears is attached below. Similar materials featuring the film’s stars, Johnny Depp and Armie Hammer, are also slated to appear in more than 1,000 Kawasaki dealerships around the country. Dealers will also be a core component of Kawasaki’s “Live the Legend Adventure” sweepstakes, which will invite consumers to text entries for a chance to win various products inspired by “The Lone Ranger.” The sweepstakes will also include film promotional partner, the Utah Office of Tourism. Chris Brull (Kawasaki Marketing Director) says: “This is an opportunity for Kawasaki to generate a great deal of excitement around product categories that are a perfect fit for the film’s characterizations. “The Lone Ranger”-inspired Kawasaki vehicles will be featured as prizes in other film tie-in promotions, including five limited edition Kawasaki Teryx4 750 4×4 LE Side x Sides to be given away by SUBWAY Restaurants in their Partner Up & Win promotion, and a Teryx4 and four Shoei off-road helmets as the grand prize for an ABC-TV “Good Morning America” sweepstakes. In addition to media and in-store involvement supporting the film’s release, Kawasaki is also providing a custom-designed Lone Ranger Ninja ZX-6R sportbike that will be on display at the movie’s world premiere. That event is a benefit for the American Indian College Fund, and the unique motorcycle will be signed by the film’s stars and other celebrities in attendance. It will then be auctioned at a later date with all proceeds going to support the fund. NO PURCHASE OR PAYMENT OF ANY KIND IS NECESSARY TO ENTER OR WIN. A PURCHASE WILL NOT IMPROVE YOUR CHANCES OF WINNING. VOID IN AK, HI, PUERTO RICO AND WHERE PROHIBITED BY LAW. MESSAGE AND DATA RATES MAY APPLY. The Kawasaki “Live the Legend Adventure” Sweepstakes is open to legal residents of the 48 contiguous United States and District of Columbia, of the legal age of majority in their jurisdiction of residence (at least 18 years of age; 19 in AL and NE), who have a valid, state-issued driver’s license as of the time of entry. Begins at 12:01 AM ET on 06/03/13 and ends at 11:59 PM ET on 07/31/13. TO ENTER WITHOUT SENDING A TEXT: mail a hand-printed 3” x 5” card with your name, age, complete address, including ZIP code, daytime telephone number, and email address, if you have one, in a stamped envelope to: Kawasaki’s “Live The Legend Adventure” Sweepstakes, 625 Panorama Trail, Suite 2100, Rochester, NY 14625-2437. Must be postmarked by 7/31/13 and received by Sponsor by 8/7/13. For Official Rules and complete details, visit www.Livethelegend.Kawasaki.com. If you enter via text messaging, you will receive at least one (1) confirmation text message in response to your entry. To stop receiving text messages from Sponsor, text “STOP” to 868727. 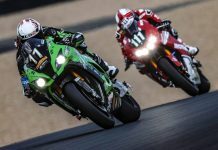 Sponsor: Kawasaki Motors Corp., U.S.A., P.O. Box 25252, Santa Ana, CA 92799.